When I started this project a week ago, I figured I’d be very happy to see the back of it and let it go into the college’s costume stock to maybe be worn on stage someday (an exciting idea); however, I’ve grown rather attached to it and Ben said he wants it so I’m paying a fiver to keep it. I don’t actually have a photo of the finished product in its entirety, but I’ll get one on Monday to post and that will be the LAST you’ll hear about it, I promise. At least, the last you’ll hear until I get a photo of Ben wearing it at Christmas! Moving on to… ethnic trousers! These were MUCH more fun and so easy to make. Our tutor, Karen, gave us all copies of a few different patterns – they all start as rectangles, then get cut up and flipped around to make up trousers in clever, efficient ways. Seriously, some of these have no wastage at all! We all chose a different pattern so we could see the similarities and differences. 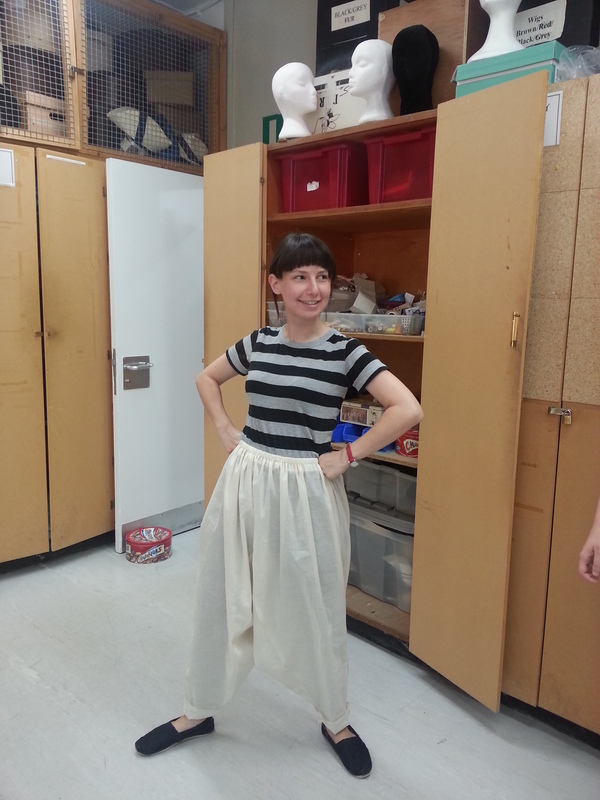 I made the Allacache style trousers – I figure I need to get over my distrust of gussets sooner or later, so of course I picked the pattern with the giant gusset. Again, really not so bad! 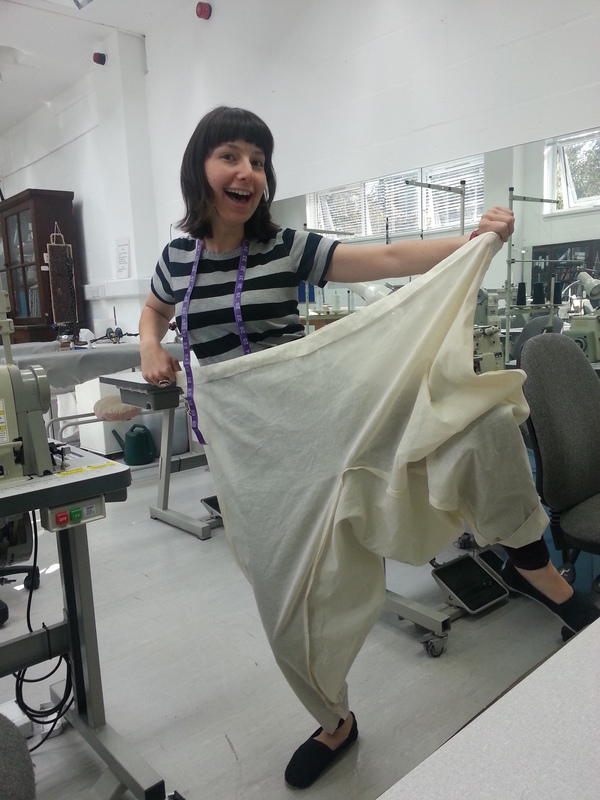 You can see where the diamond-shaped gusset seams into the trouser legs in the goofy photo of me, above. Plus a few more shots for your education/enjoyment. The last exercise of the day was a tiny sample of the Churidar pattern on the bias, where you start with a rectangle of fabric on the straight grain and manipulate it so it ends up on the bias. Karen gave us all the instructions and then let us puzzle it out for ourselves. I’m not ashamed to say I only figured it out cuz I saw what some of the other girls were doing and copied them! Ingenious, really. It was a mind-bending exercise and completely eye-opening to the potential of clever, but simple, pattern-cutting.